This is a medium sized map representing a part of a derelicted castle. 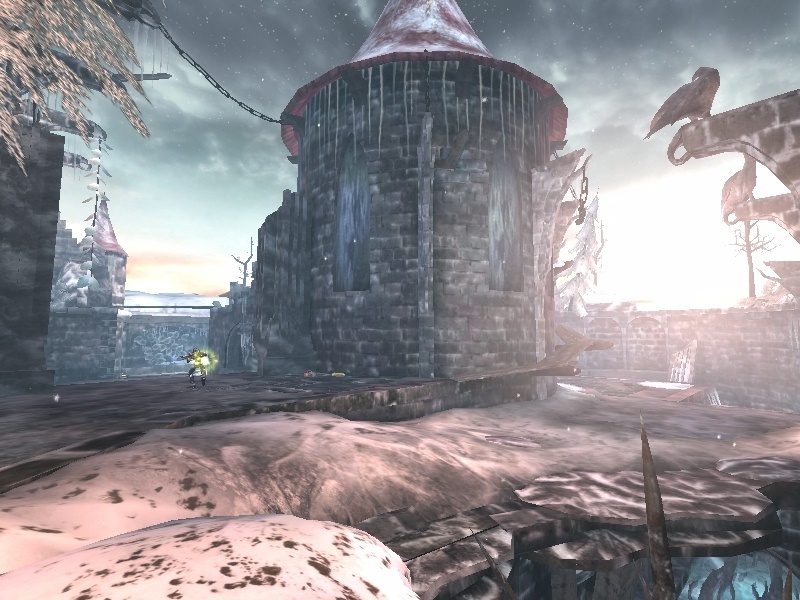 There are some open-air areas and an underground level. Named after the goddess of discord or the goddess of atmosphere? 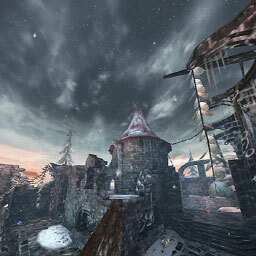 Either way, thanks to Vladimir - VoodariuS - Mikhalev, DM-Aeris blends both into an chillin medieval fragzone. 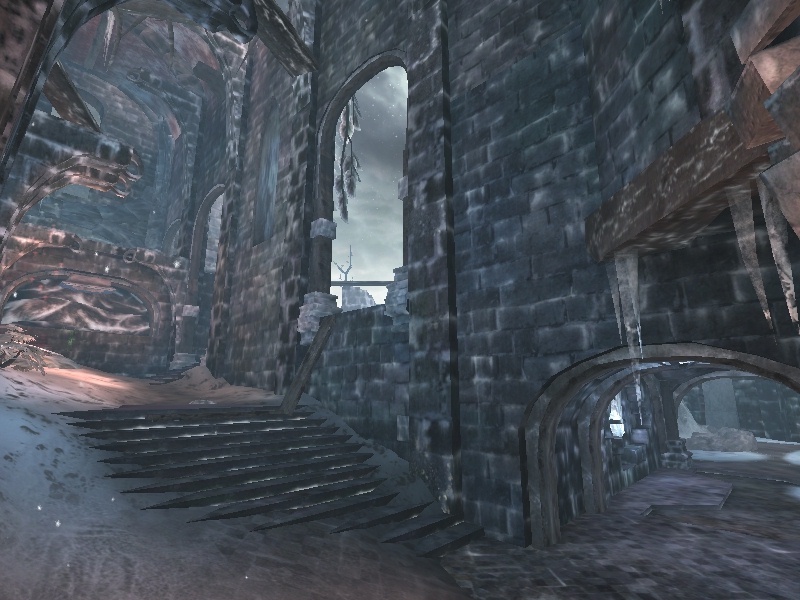 DM-Aeris is a winter-beaten castle with a central keep and an underground network connecting the surrounding bulwark. From the readme, the time of day is dusk, so with taking the sun sets in the west (nice lense flare) I will use that reference to describe the rest. Starting with the North wall and its imposing gate, leads us East towards a large corner round tower, or West to run the gambit in a long open hall. Both directions offer a dive to the underground passages, while heading East will allow a player to round the main keep to the South courtyard, or climg some planking up to the keep. From the Northeast corner tower south is the ruins of a great hall, the northern most floor has given way to the cellar and some mysterious flames burn in the alcoves. The roof too has given way to fallen trees and the South corner spews a jump pad to the ledge above runing the length of the hall. 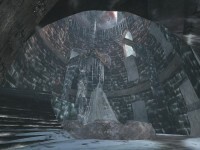 The South courtyard sinks in the middle to access the lower depths, while the end terminates in a spiral stair connecting us back up to the open hall leading north. 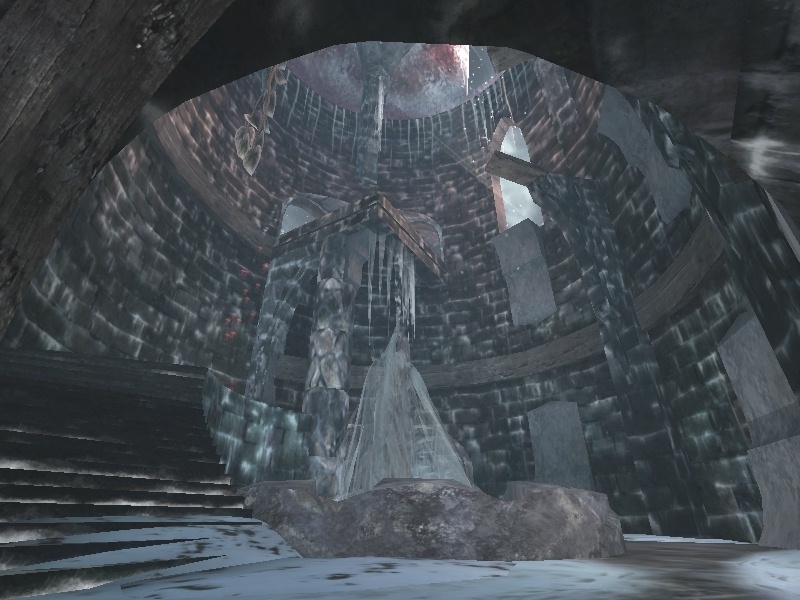 The Central keep can also be accessed from underground, behind a frozen fountain spirals a short flight of steps to another arrow spewing jump pad that'll take players skyward. AThe the top, one can look over the west hallway into the setting sun, or venture out to survey the South courtyard. A thin long board impossibly spans the the gap between the keep and a square roof top patio adjacent to the East hall. The lower interlocking digs foster some glowing crystals, a subterranean creek, icey floors, unusual shrubs and the afore mentioned fountain. Masked reflective stone blocks and saturated blue light push the wet cold further into the bones. The theme undoubtily cries CASTLE, and the ruins that are left to behold are both visually satisfying and delivers scope in the variety of aspects in exploring the confines. A great deal of brushwork, meshes and textures have been used to excellent effect, a fair number being custom. Antiportals, blocking volumes and good zoning, all contribute to player movement and frame rates. Several terrain actors carpet the various zones, blending BSP and mesh surfaces superbly. Light cone meshes are used to accent the setting sun, and cast radiance through the dilapidated wood work. The lowest light cones are out of angle with the sun, as is the sunlight actor. There are conflicts in illumination, insuffient sourcing and heavy saturation help eye weary combatants, but degrade the atmosphere. Especially the flaming alcoves lack means of combustion and would have benefited from projectors along with the emmiters that are present. SoundFX are located throughout the map, some scripted triggers for creaking wood and other footsteps. Ambient sounds accompany the weather effect of falling snow and the irritating cry of crows echos off the stone walls. On the whole continuity and connectivity create an outstanding framework for a Deathmatch. A variety of options for navigating through the map exist. 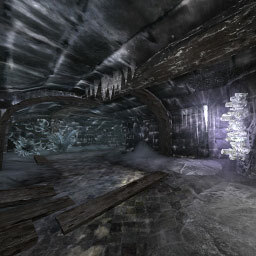 Players will typically be found in the North and South courtyards either attempting to gain the upper ledge of the East hall or exiting the stranglehold of the tight lower passages. Only one bush in the icey cave snags passerbys, small pittance for otherwise strong playability. Item placement is on the over abundant side of the scale. Normal two ammo for a weapon is in evidance throughout, in addition to the usual litter. Item selection is also suspect, besides close proximity of collective firepower, which attributes bots favoring the East hall. The local of the map's two power-ups also lack risk incentive, swapping the big armor for the health in the North East round tower and moving the rocket launcher to in front of the gate may improve the load out. And pity the poor soul stuck with the snot gun in the bottom of the South courtyard. Perhaps an analytical approach to effective environments for the various weps is in order, as none seem suited to where deposited. Another contention is the maps two jump pads... the vapor of arrows alerting players is distrubing. Simple lifts would have better befitted the theme, and maybe permitted some lift-jumps. As it stands the pads are over powered and leave players in a very predictable air. Even with these pit falls, Aeris stands the test and has an admirable replay factor, mainly due to the visuals and a couple spots tailored for trick jumps. Bots do the job, garnering most of the iyems, except the health vials cached in the South wall (niether will you). Player count should remain light, upwards of 5 players (3-5 by Author) and the map becomes crowded, even though items are too plentiful for the size. The reviewer suggests servers that like spamfests increase the load to the full 9, matching the actual number of playerstarts. Obviously it is the visuals and quality build that win out here. Despite the comments made on lighting, the map is above par as to acceptable sourcing. Replacing the jump pads with lifts and more conservitive minded item placement will assist gameplay. If anything, the author has proven a mastery at delivering theme. Since castles are a particular favorite of the reviewer, highly recommends this map to those similarily inclined. holy crap man. this map rocks my socks. incredible visuals. amazingly polished. and she plays like a greased scottsman. best map i've seen in a while! edit: but i think you could have done better then my crappy snow meshes on the floor :P they were a real hack. I think NeoDuck pretty much said it all, hats off. NICE MAP! This is the best map i have ever played on UT2k4! Like I said: The Best! I wanted to have a map with the name Aeris, and just turned the word around..
Nahh its kinda funny to see Sirea and Aeris in one list. Not that its bad, but different. Aaaaaaand.. now going to check it out in my trusty ued. Nice, I personally hate jumppads more than badly designed egyptian maps though. visually its nice, but like i said before i expected more. I was hoping to have a nice view over other parts of this bastion like building, or maybe some nice high mountains that you cant reach. And well.. maybe im spoiling myself in my own maps.. It felt kinda empy, sure it doesnt but i like to see it balancing on the edge of insanity, detail wise. Also the texturing on some of the smaller meshes (snow puddles with a shader sheeth), the tree texture and the brick texture all couldve needed some extra polishing, texturewise for the brick texture, and uvw wise for the other 2. Also one floor (i found one... for now :p) halfway suddenly lost its reflectioncubemap-thingy surface. Yes, most is itty nitty nitpicking, but im sure the author doesnt mind, so he'll know what to look out for next time. No real problems there, though i'd lose the collision of the small fern-like plants. And try to make sure you cant get stuck behind most stuff, unless really intended.. most players dont like bumping against stuff. But it didnt blow me away. But ive been working on a map thats so full with "stuff" most maps atm look kinda empty lol. This map is AWESOME !! The environement is very good. I really like the ambience emaning of this map..
Continue in this way ! Layout is nothing to write home about... a few too many cramped areas and "sticky" meshes for my liking. It looks really nice and visuals are consistent. I don't see rooms as cramped too much, but it is indeed more close quarter (what I like much more than hitscan maps). What I don't like... I miss sounds on jumppads (some setting problem? other maps are good thou ;-)) - and they are too high. I hear too many triggered sounds - and still the same (maybe three) - you could try to change pitch here and there. Some of them are triggered even when I'm close to some wood, but not actually going on it (the same with that icy slope). Also walking on that slant tree with branches... it looks wierd. The last thing... I can grab flak/sniper/rocks/shock/a100 in 10 seconds. I know that such a test is a way too analytic, but good player can own this part fatally with another 17 seconds to do anything bad to the opponent with 3 healths near (a lot of time to go for mini a50 and back also). Simply put, weapon distribution favours only that two top levels near around a100. No reason to go anywhere else. "7.5 - It is not enough for such map! I give 10/10"
Do you have 3369 server? It stopped to crash down because of the maps. I had the same problem with original Solitude and Backspace and even Waisten was fixed because of this, but all the maps ran fine later on 3369. This may be the same problem. 2) Jump pads send you way, way too high in the air. nice work! the lighting is a little bland but it fits the atmosphere nicely. layout and meshes are good. some places were a little narrow imo. Nice details, outstanding visuals, "cool" theme. But i missed something while playing.. .the gameplay is good, but imho it could have been made more fluent. Some blocking things and One-Way-Paths lowed the rating to a 8 instead of a 9.. But overall very nice map! Great layout for gameplay and unique visuals make this map definitely worth a download. Another quality job from this mapper. Great looking map. I've having difficulty deciding on a rating though. For looks it's a 10+, but that underground area is seriously devoid of activity. 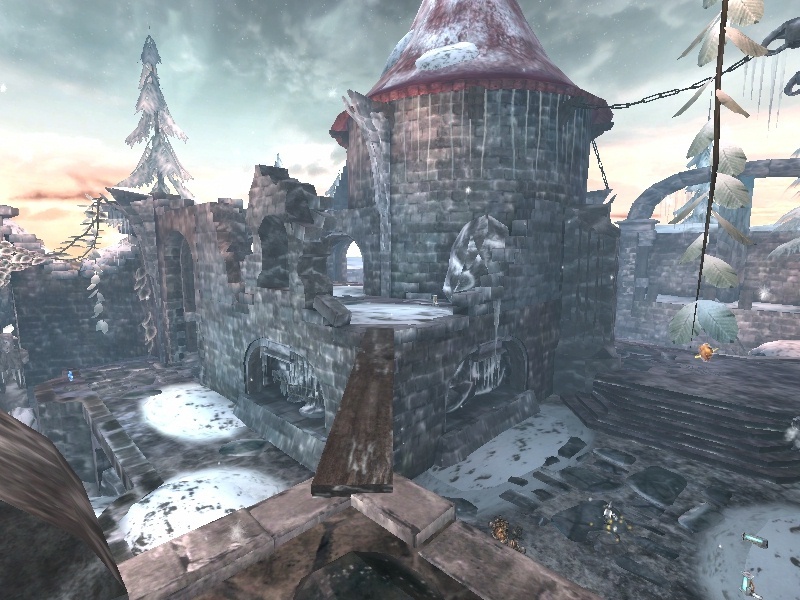 It wouldn't take much to turn this into one of the best maps out there. 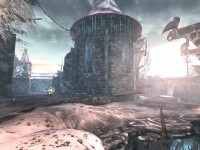 As it is gameplay is restricted to one level which makes the whole thing average. sorry, it's just a fortuity. The map was surprisingly fast regardless of the numerous overload of decos and meshes. (that's a good thing.) It was pretty large in x and y, but would love to see more z. maybe a keep that towers over map and houses a sniper rifle or something. The theme wasn't a surprise to me, for all the maps I've seen you make have a bizzare yet dark castle theme. The map is great, however even though the theme is getting worn. You put alot of lights to good use with their friggin sweet coronas, like the sun flare and the crytals. Color scheme is boring, but good game structure, and high-quality detalisation. 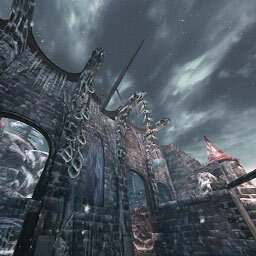 I see big progress by the side of previous maps of VoodariuS (DM-1on1-Lacrima, for example). My rating is 9.5 - in the hope of forthcoming maps. better in certain other maps. For example his own Fairyland.